If the sage Constantine "Cus" D'Amato was still alive today, he would've been 105 years old! He was the manager and trainer of Mike Tyson, Floyd Patterson, Jose Torres, and Vinnie Ferguson. 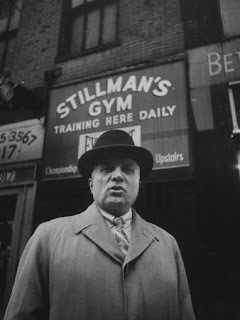 What made D'Amato different than other boxing managers or trainers was that he taught his fighters the crucial lesson of fear... what it was about and how to deal with the fear. “Fear is the greatest obstacle to learning in any area, but particularly in boxing. For example, boxing is something you learn through repetition. You do it over and over and suddenly you’ve got it. …However, in the course of trying to learn, if you get hit and get hurt, this makes you cautious, and when you’re cautious you can’t repeat it, and when you can’t repeat it, it’s going to delay the learning process…When they…come up to the gym and say I want to be a fighter, the first thing I’d do was talk to them about fear…I would always use…the same example of the deer crossing an open field and upon approaching the clearing suddenly instinct tells him danger is there, and nature begins the survival process, which involves the body releasing adrenalin into the bloodstream, causing the heart to beat faster and enabling the deer to perform extraordinarily feats of agility and strength…It enables the deer to get out of range of the danger, helps him escape to the safety of the forest across the clearing…an example in which fear is your friend.